What Cancers Are Linked to BRCA2 Mutations and How Common Are They? Many people are aware that BRCA2 gene mutations are associated with an increased risk of breast cancer, but these mutations have also been linked with ovarian cancer, pancreatic cancer, prostate cancer, lung cancer, and leukemia. While BRCA2 mutations are often linked together with BRCA1 mutations, there are many important differences. The two mutations confer different risks for breast and ovarian cancer and are also associated with different cancers in other regions of the body. For example, pancreatic cancer is more common with BRCA2 mutations but not BRCA1 mutations. Understanding the differences in these mutations is important in understanding your family history as well. Your doctor may be more concerned if you have one close relative who had breast cancer and one who had pancreatic cancer than if you had two with breast cancer. Pancreatic cancer is less common than breast cancer, and when it occurs in association with breast cancer it raises a flag suggesting a BRCA2 mutation may be present. Let's look at how exactly a BRCA2 mutation can increase cancer risk, the cancers associated with this mutation, who should be tested, and the options available to reduce cancer risk or at least detect these cancers as early as possible. A quick review of genetics can make BRCA mutations easier to understand. Our DNA is made up of 46 chromosomes, 23 from our fathers and 23 from our mothers. Genes are sections of DNA found in chromosomes that code for specific functions. They are like a blueprint the body uses to make proteins. These proteins then have a wide array of functions ranging from the hemoglobin in your blood that binds oxygen, to protecting you from cancer. Mutations are areas of damaged genes. When the gene or blueprint is damaged, an abnormal protein can be made which doesn't work like that normal protein. There are many different types of BRCA mutations. The "code" in genes is compromised of a series of letters (known as bases). Series of these letters tell your body to put different amino acids in order to make a protein. Not uncommonly a base is deleted (deletion mutations), sometimes one is added, and sometimes several of the bases are rearranged. The BRCA gene is a special gene called a tumor suppressor gene which has the blueprint for proteins which help to protect us against developing cancer. Damage (mutations and other genetic changes) occurs in the DNA of our cells every day. Most of the time, proteins (such as those coded for in BRCA tumor suppressor genes) repair the damage or eliminate the abnormal cell before it can go through the process of becoming a cancer. With BRCA2 mutations, however, this protein is abnormal, so this particular type of repair does not occur (BRCA proteins repair breaks in double-stranded DNA). Having a BRCA mutation is relatively uncommon. BRCA1 mutations are found in roughly 0.2 percent of the population, or 1 in 500 people. BRCA2 mutations are somewhat more common than BRCA1 mutations and are found in 0.45 percent of the population, or 1 in 222 people. BRCA1 mutations are more common in those of Ashkenazi Jewish heritage, whereas BRCA2 mutations are more variable. It's important to note that there are a number of non-BRCA gene mutations that raise breast cancer risk (BRCA mutations are responsible for only 9 percent to 29 percent of hereditary breast cancers), and testing for many of these mutations may wish to be considered as well. Breast cancer: Breast cancer due to a BRCA mutation accounts for 20 to 25 percent of hereditary breast cancers. Women who have a BRCA2 mutation have a 45 percent chance of developing breast cancer by the age of 70 (slightly lower than with a BRCA1 mutation). Men with a BRCA2 mutation also have an elevated risk, but this risk is only around 1 percent. Women and men with a BRCA mutation also tend to develop breast cancer at a younger age. Ovarian cancer: Women who have a BRCA2 mutation have an 11 to 17 percent chance of developing ovarian cancer by the age of 70 (also somewhat lower than with a BRCA1 mutation). Women with a BRCA2 mutation tend to develop ovarian cancer at a younger age than women without the mutation. Prostate cancer: Men with both BRCA1 and BRCA2 mutations are 4.5 to 8.3 times more likely to develop prostate cancer. Those with BRCA2 mutations (unlike BRCA1) often develop aggressive prostate cancer and the 5-year survival rate is around 50 percent (compared to a 99 percent 5-year survival rate in the general population). Pancreatic cancer: The risk of pancreatic cancer is also increased. For those who develop pancreatic cancer, one review noted that while survival for those with BRCA2 mutations was lower than those who developed sporadic pancreatic cancer, those with the mutations did much better with chemotherapy than non-mutation carriers. Lung cancer: We don't have a lot of research on the effect of BRCA2 mutation on lung cancer risk. In one study, women who smoked and had a BRCA2 mutation were twice as likely to develop lung cancer than their mutation negative counterparts. Leukemia: People with BRCA1 mutations do not appear to have an increased risk of leukemia. The risk does appear to be elevated in women with BRCA2 mutations who have had chemotherapy for breast cancer. Unlike the increased risk of colon cancer in some people with BRCA1 mutations, one study did not find any increased risk in those with BRCA2 mutations beyond that of the general population. Other studies have supported this finding. Screening guidelines recommended that all people have a screening colonoscopy (or comparable testing) at the age of 50. 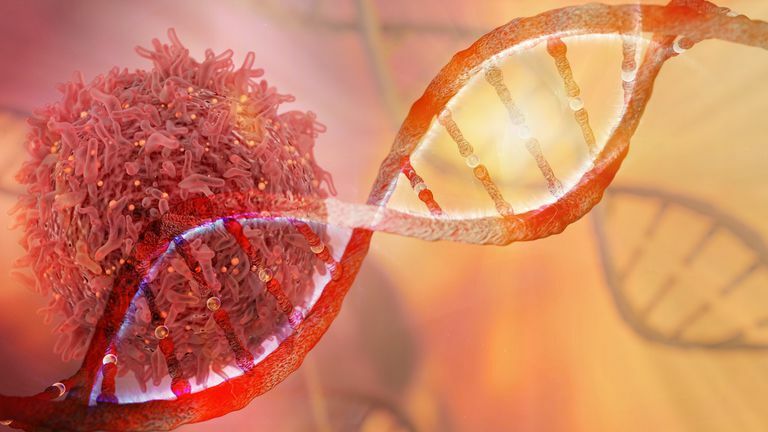 People who inherit two copies of a mutated BRCA2 gene, in addition to the cancers above, are more likely to develop solid tumors in childhood and acute myeloid leukemia. Early detection: Early detection is the process of trying to find a cancer which has formed at the earliest stage possible. With many cancers, we know that survival is higher when it's found at an early stage (for example, stage 1 or stage 2) than if it is discovered at a later stage (such as stage 4). With early detection, the goal is to find cancer before it would otherwise cause the symptoms that would lead to its discovery. We don't have methods to detect all cancers at these early stages, and the tests we do have are not perfect. For example, many have heard of women who have breast cancer despite having had a normal mammogram. Risk Reduction: Risk reduction strategies work to reduce the risk that a cancer will develop in the first place. They are designed to prevent a cancer from occurring. Methods of reduction may include surgery or medications (chemoprevention). Most approaches to a genetic predisposition to cancer include either screening or risk reduction, but there is one test that can do both. Colonoscopy can be used to detect colon cancer in the earliest stages. It can, however, be used to reduce the risk of a person getting cancer if a pre-cancerous polyp is found and removed before it becomes malignant. We don't have screening or treatment options for all cancers linked with BRCA2 mutations. It is also early in the process of determining which screening methods and treatments are best, so it's important to have a physician who is experienced in caring for BRCA mutation carriers. Let's look at options by cancer type. Screening: Depending on your mutation and family history, screening is usually started at an age much younger than for people without a mutation. Screening tests may include mammography, breast MRI, and ultrasound. Mammograms are less accurate in younger women due to the density of their breasts and MRIs are usually the preferred method. Chemoprevention: The medications known as selective estrogen receptor modulators (SERMS) can reduce the risk of developing breast cancer up to 50 percent. Medications available include tamoxifen and Evista (raloxifen). Surgery: A bilateral mastectomy greatly reduces the risk of developing breast cancer. Timing of surgery, however, depends on many factors, including a woman's reproductive plans and desire to breastfeed. Screening: We don't currently have a satisfactory screening method for ovarian cancer. Physicians may consider tests such as transvaginal ultrasound, clinical exams, and CA-125, but we do not yet know if such screening improves survival. Chemoprevention: The use of birth control pills may reduce the risk of ovarian cancer up to 50 percent with longer-term use. Surgery: Removal of the ovaries and fallopian tubes (salpingo-oophorectomy) can reduce the risk of ovarian cancer. As with breast cancer after a mastectomy, some women may still get ovarian cancer but it is much less common. Current screening for prostate cancer is ridden with controversy, including that surrounding PSA testing. For those who carry a BRCA2 mutation, it's important to work with a urologist who is familiar with the more aggressive disease found in men with these mutations. Current guidelines for the general population should not be followed for men who have BRCA2 mutations. The American Society of Clinical Oncology suggests a yearly PSA and digital exam beginning at the age of 40. People who carry a BRCA2 mutation have an increased risk of developing several types of cancer. For some of these, there are methods of screening which may aid in early detection, as well as surgical and medical ways to reduce risk. Certainly, a healthy lifestyle can't be understated when combined with one of these mutations, as we know that BRCA mutations do not guarantee you will get cancer. Many people ask about testing, but at the current time testing is only recommended for those who have a personal or family history that suggest the mutation may be present. Leao, R., Price, A., and R. James Hamilton. Germline BRCA Mutation in Male Carriers—Ripe for Precision Oncology. Prostate Cancer and Prostatic Disease. 2017 Dec 14. (Epub ahead of print). Maxwell, K., Domcheck, S., Nathanson, K. et al. Population Frequency of Germline BRCA1/2 Mutations. Journal of Clinical Oncology. 2016. 34(34):4183-4185. Warner, E. Screening BRCA1 and BRCA2 Mutation Carriers for Breast Cancer. Cancers. 2018. 10(12).pii:E477.